Auritibicen kyushyuensis is found in Japan and is known as Kyushu-ezo-zemi. 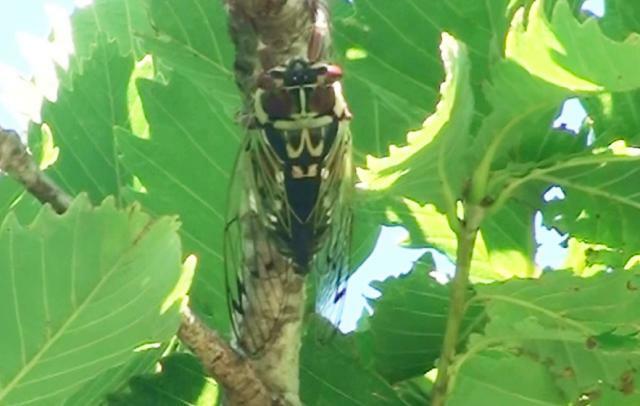 For more information about this cicada, visit Cicadae in Japan. There are two subspecies of Cryptotympana holsti: Cryptotympana holsti holsti Distant, 1904 and Cryptotympana holsti takahashii Kato, 1925. Cryptotympana holsti is found in Taiwan, China, Vietnam, Cambodia, Laos, and perhaps elsewhere in southwestern Asia. Characters. — Head broad, more or less transversely truncate between the eyes, including which it is a little broader than the base of mesonotum, its length only slightly more than half the breadth between eyes, ocelli about twice the distance from eyes as from each other, front slightly prominent; pronotum about as long as mesonotum, its lateral margins oblique, the posterior angles a little ampliate; abdomen in male about as long as space between apex of head and base of cruciform elevation, the tympanal orifices concealed by the tympanal coverings; opercula in male well developed, varying in shape and size; metasternum elevated at middle and furnished with a posterior process directed backward; anterior femora strongly spined beneath; tegmina hyaline or semi-opaque, basal cell longer than broad; apical areas eight. 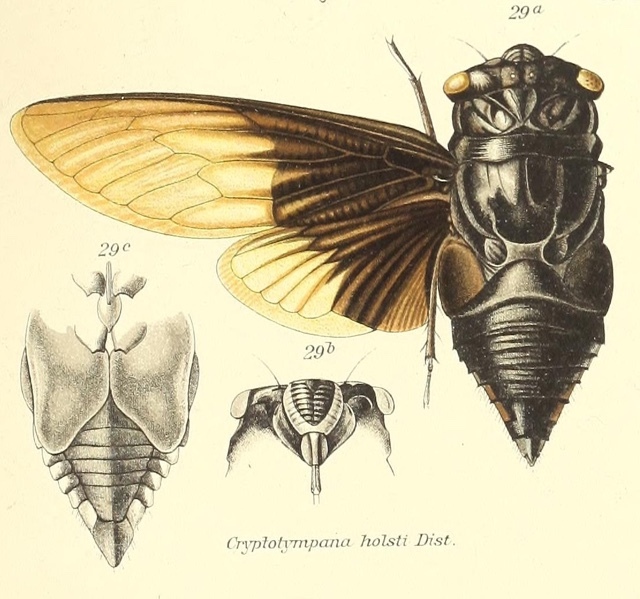 Graptopsaltria bimaculata Kato, 1925. Formerly known as Graptopsaltria tienta. Yes, its species name as changed since 1913! It is found in China and Japan. 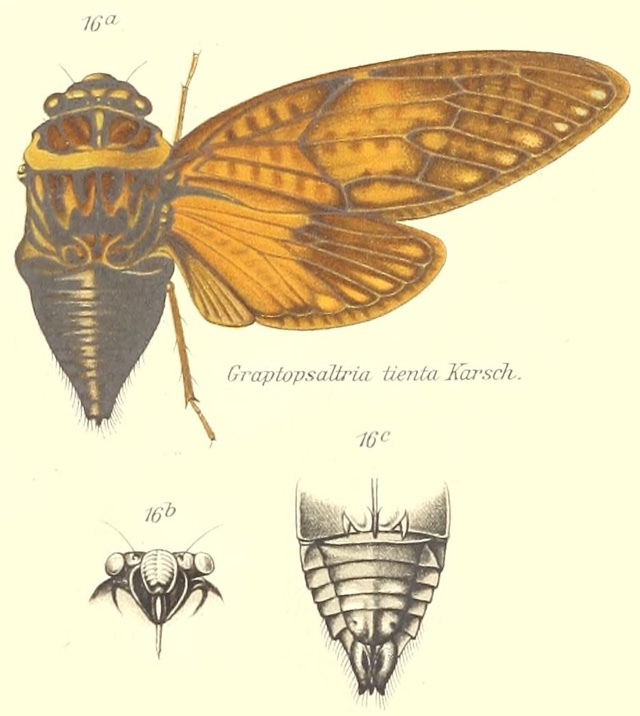 The image says Graptopsaltria tienta but now the cicada is known as Graptopsaltria bimaculata. Characters. — Body robust, attenuated posteriorly; head, including eyes, narrower than the anterior lateral margins of the pronotum; ocelli wider apart from eyes than from each other; rostrum extending to about posterior coxae; pronotum with the lateral margins irregularly convex, not prominently ampliated or laminately expanded; anterior femora robustly spined; tympana practically covered ; opercula short, broad, not extending beyond basal segment of abdomen; tegmina opaque, apical areas eight, transverse vein at the base of the second apical area much curved, interior ulnar area not distinctly widened at apex; wings opaque, apical areas six.